HubSpot is great at showing you reports that have to do with your contacts. Where they came from, what they did on the site, what forms they filled out, etc. Facebook does a great job at letting us know which ad creatives drove engagement and can report on which ones had a strong conversion rate. If you're using the Event Source Groups (ESGs) tracking in Facebook you'll already have access to loads of data as to what people are doing. Using a Facebook pixel coupled with ESGs you can track custom events on your website too and gather these together into omni-channel analytics, but you're not going to get the same granularity as HubSpot because there are limits to what Facebook can track through your pixel. If you want to know which contacts were generated from which ad, you have a bit of a gap. Here's how to close the gap and get better reports. 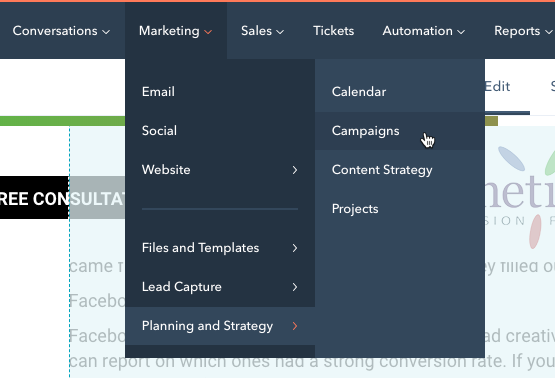 If you haven't already started playing around with the Campaign features in HubSpot, I'd recommend it. You can find them under your Marketing > Planning and Strategy menu. When you have your campaigns set up, you can group together website pages, blog posts, social media posts and other assets that are part of your campaign to get a better idea of the full reach of your campaign and to compare your campaigns against each other. It also lets you see the combined effort of your social media, blogging, paid ads, etc. all together. Knowing which ads are converting is good, and knowing which people are converting is good, but you can really take things to the next level when you know which ads are converting which leads. Going through the source reports will get you the traffic source and the keyword data, but not necessarily much more. But... HubSpot heard that we want more data! Now when you go into your Traffic Analytics report there is a new option for UTM Parameters. If you've been generating UTM tagging for your links for your ads, you will already see this data populated in there. 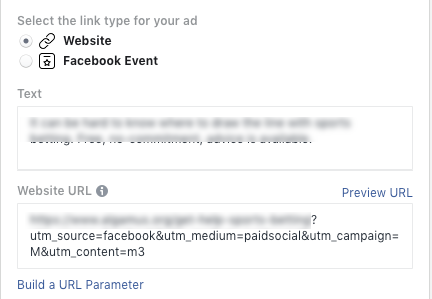 You can change your view to see the Campaign, Source, Medium, Content or Term for your link clicks, which can fill in the blanks on how your specific ads are working. If you haven't been generating UTM tagging for your ad links, here's how. You don't need to use HubSpot to generate these links, there are lots of other tools (my personal fave is Raven Tools UTM Generator) but we're going to do it the HubSpot way here. 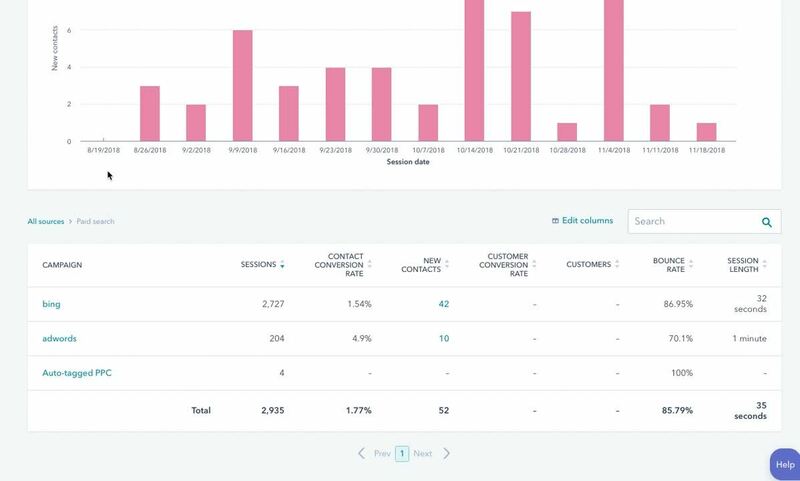 Pop back over to your "Campaigns" screen and either create a new campaign that you want to track or edit an existing one that you want to collect data for. You'll notice a few places where you have the option to "Create Tracking URL". Click on that. What displays there is your typical Campaign, Source, Medium UTM parameters which will fill in your basic referrer info. But you want more than that so click on the Advanced View link at the bottom of that pop-up window and you'll also get the parameters for Content and Term. Generally, you'll use the Content field to identify your ad content and the Term field to identify the keyword term if it's a search ad. This data lets us identify not just which ads are converting, but because we know exactly who converted from which ones, we can see which ones are great leads and which ones are tire-kickers or time wasters which helps us revise our messaging and make our ad spend even more effective. When you set up UTM tracking to track your individual ads you'll not only see this data in HubSpot but you'll also see it in Google Analytics too. Have you started using this feature in HubSpot? What are your experiences?